New Zealand (/njuː ˈziːlənd/; Māori: Aotearoa [aɔˈtɛaɾɔa]) is an island country in the southwestern Pacific Ocean. The country geographically comprises two main landmasses – that of the North Island, or Te Ika-a-Māui, and the South Island, or Te Waipounamu – and numeroussmaller islands. New Zealand is situated some 1,500 kilometres (900 mi) east of Australia across the Tasman Sea and roughly 1,000 kilometres (600 mi) south of the Pacific island areas of New Caledonia, Fiji, and Tonga. Because of its remoteness, it was one of the last lands to be settled by humans. During its long isolation, New Zealand developed a distinctive biodiversity of animal, fungal and plant life. The country's varied topography and its sharp mountain peaks, such as the Southern Alps, owe much to the tectonic uplift of land and volcanic eruptions. New Zealand's capital city is Wellington, while its most populous city is Auckland. Polynesians settled New Zealand in 1250–1300 CE and developed a distinctive Māori culture. Abel Tasman, a Dutch explorer, was the first European to sight New Zealand in 1642 CE. In 1840, representatives of the British Crown and Māori Chiefs signed the Treaty of Waitangi, making New Zealand a British colony. Today, the majority of New Zealand's population of 4.5 million is of European descent; the indigenous Māori are the largest minority, followed by Asians and Pacific Islanders. Reflecting this, New Zealand's culture is mainly derived from Māori and early British settlers, with recent broadening arising from increased immigration. The official languages are English, Māori andNew Zealand Sign Language, with English predominant. The country's economy was historically dominated by the export of wool, but exports of dairy products, meat, and wine, along with tourism, are more significant today. Nationally, legislative authority is vested in an elected, unicameral Parliament, while executive political power is exercised by the Cabinet, led by the Prime Minister, who is currently John Key. Queen Elizabeth II is the country's head of state and is represented by a Governor-General. In addition, New Zealand is organised into 11 regional councils and 67 territorial authorities for local government purposes. The Realm of New Zealand also includes Tokelau (a dependent territory); the Cook Islands and Niue (self-governing states in free association with New Zealand); and the Ross Dependency, which is New Zealand's territorial claim in Antarctica. New Zealand is a member of the United Nations,Commonwealth of Nations, ANZUS, Organisation for Economic Co-operation and Development, Pacific Islands Forum and Asia-Pacific Economic Cooperation. 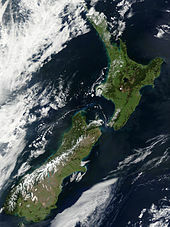 The snow-capped Southern Alps dominate the South Island, while the North Island's Northland Peninsulastretches towards the subtropics. Aoraki / Mount Cook viewed from the road to Mount Cook Village, located in the Southern Alps. Much of New Zealand's South Island landscape is mountainous. New Zealand is located near the centre of the water hemisphere and is made up of two main islands and a number of smaller islands. The two main islands (the North Island, or Te Ika-a-Māui, and the South Island, or Te Waipounamu) are separated by the Cook Strait, 22 kilometres (14 mi) wide at its narrowest point. Besides the North and South Islands, the five largest inhabited islands are Stewart Island, the Chatham Islands, Great Barrier Island (in the Hauraki Gulf), d'Urville Island (in the Marlborough Sounds) and Waiheke Island (about 22 km (14 mi) from central Auckland). The country's islands lie between latitudes 29° and 53°S, and longitudes 165°and 176°E. New Zealand is long and narrow (over 1,600 kilometres (990 mi) along its north-north-east axis with a maximum width of 400 kilometres (250 mi)), with about 15,000 km (9,300 mi) of coastline and a total land area of 268,000 square kilometres (103,500 sq mi) Because of its far-flung outlying islands and long coastline, the country has extensive marine resources. Its Exclusive Economic Zone is one of the largest in the world, covering more than 15 times its land area. The South Island is the largest landmass of New Zealand, and is divided along its length by the Southern Alps.. There are 18 peaks over 3,000 metres (9,800 ft), the highest of which is Aoraki / Mount Cook at 3,754 metres (12,316 ft). Fiordland's steep mountains and deep fiords record the extensive ice age glaciation of this south-western corner of the South Island.. The North Island is less mountainous but is marked by volcanism. The highly active Taupo Volcanic Zone has formed a large volcanic plateau, punctuated by the North Island's highest mountain, Mount Ruapehu (2,797 metres (9,177 ft)). The plateau also hosts the country's largest lake, Lake Taupo, nestled in the caldera of one of the world's most activesupervolcanoes. The country owes its varied topography, and perhaps even its emergence above the waves, to the dynamic boundary it straddles between the Pacific and Indo-Australian Plates. New Zealand is part of Zealandia, a microcontinent nearly half the size of Australia that gradually submerged after breaking away from the Gondwanan supercontinent.About 25 million years ago, a shift in plate tectonic movements began to contort and crumple the region. This is now most evident in the Southern Alps, formed by compression of the crust beside the Alpine Fault. Elsewhere the plate boundary involves the subduction of one plate under the other, producing the Puysegur Trench to the south, the Hikurangi Trench east of the North Island, and the Kermadec and Tonga Trenches further north.